The following tutorial explains the user the pre and post fader metering options included in Pro Tools and how to switch between them. CLICK HERE to learn Avid Pro Tools one on one with a digital audio professional at OBEDIA. Pre-Fader Metering: The meter on the channel strip will show the level before the fader, after the inserts, filters and EQ sections. This mode is normally used when recording, so the engineer can “see” at the meter, the level of the signal recorded. Post-Fader Metering: The meter on the channel strip will show the level after the fader. Therefore, the position of the fader will affect the lecture of the meter. This mode is mostly used when mixing, so the engineer can “see” at the meter, the level of the channel strip after the fader, which would be in fact the level of the signal added to the mix bus. This is the default mode in Pro Tools. Now that Pre-Fader and Post-Fader Metering have been explained, a step-by-step tutorial is presented to show the user how to switch these modes. The picture above shows a Pro Tools session with several tracks. 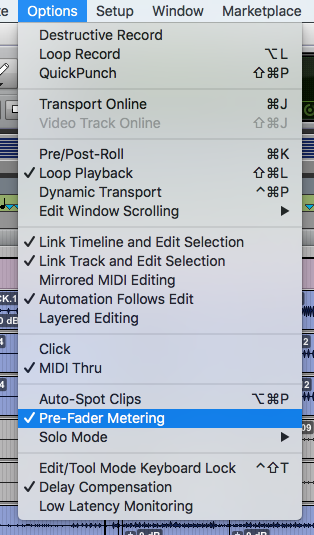 It is easy to see how the “Pre-Fader Metering” option is un-checked, which means that this option is not selected, therefore the Post-Fade Metering options is active. 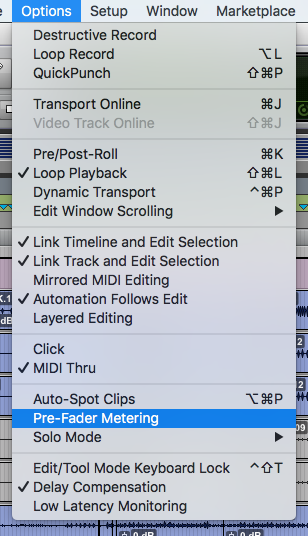 The user can now see how the “Pre-Fader Metering” option is checked, which means this is the active mode. At this point the user has learned about Pre-Fader and Post-Fader Metering in Pro Tools and how to switch between them.